Perpetrator of second largest chemical attack in Syria identified (Orient Net, 5 April 2017): Observatories operating in the provinces of Hama and Idlib revealed the identity of the commander of the aircraft that carried out the massacre on Khan Sheikhoun in Idlib countryside, which marked the second largest chemical attack in Syria after the August 2013 attacks on both eastern and western Ghoutas in Damascus. Evidence Contradicts Russia’s Account of the Syria Chemical Attack (Jeffrey Marcus, 5 April 2017): The Russian government has sharply contested accounts by international leaders and witnesses that a deadly chemical attack in northern Syria last week was carried out by Syrian government forces. Here’s what the available evidence, including a declassified four-page American intelligence report, tells us about the reliability of the Russian account. This entry was posted in Biological, Chemical, Press on 30 April 2017 by JP Zanders. 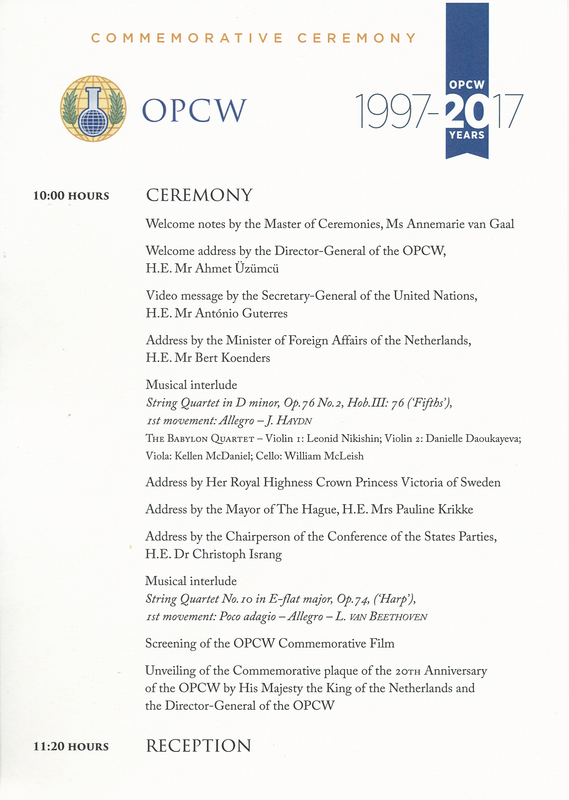 This entry was posted in Chemical and tagged Anniversary, CWC, Disarmament, OPCW on 29 April 2017 by JP Zanders. Did Iran just violate the Chemical Weapons Convention? (Majid Rafizadeh, 10 April 2017): Both Iran and Syria are signatories of the international treaty, the Chemical Weapons Convention. International attention has been directed toward the Syrian government for the use of chemical weapons against innocent people. Nevertheless, the critical role that Assad’s staunchest ally and bedfellow, the Islamic Republic of Iran, has played in these attacks should not be overlooked. Did Russia know of Syria chemical attack in advance? U.S. officials want to know (Matthew Schofield, 11 April 2017): White House officials on Tuesday said they have strong suspicions that even as Syrian jets lifted off with ghastly Sarin-loaded bombs, Russia was aware of the horror about to be dropped on the town of Khan Sheikhoun. Senior White House officials, who conducted a briefing on the attack on the condition of anonymity, described “with a high level of confidence” that Syrian warplanes dropped “at least one munition” loaded with Sarin that ended up killing about 86 people in the Syrian town April 4. They insisted that Russia and Syria had been running a disinformation campaign to create doubt internationally about the attack. What we know about the April 4 chemical attack in Syria (Dino Pisaniello, 11 April 2017): The April 4, 2017 chemical attack on the rebel-held town of Khan Sheikhoun in Syria led to at least 70 deaths and more than 100 people requiring medical attention, prompting an outcry from the international community. It led to the April 7 US bombing of the Shayrat air base. It is alleged that sarin was used in the Khan Sheikhoun attack. This particular chemical became famous in 1995 with the Tokyo subway attack, launched by members of the cult movement Aum Shinrikyo. This entry was posted in Biological, Chemical, Press on 24 April 2017 by JP Zanders. The Aftermath of an Alleged Chemical Weapon Attack in Idlib (Alexandra Bradford, 5 April 2017): Dr. Abdel Hay Tennari, who treated at least 22 critical victims from the alleged toxic gas attack in Khan Sheikhoun, said his patients’ symptoms were consistent with Sarin gas and the field hospital where he works has run out of the antidote. Syrian village hit by suspected chlorine attack hours after US condemns Assad (MEE staff, 6 April 2017): The Syrian government has been accused of carrying out a chlorine attack in Syria, hours after the US had condemned a chemical attack in southern Idlib that killed scores. Video footage shared on social media showed what appeared to be Syrian government helicopters dropping barrels filled with chlorine on the village of al-Lataminah in northern Hama. Russia must explain possible role in chemical attack, top Trump adviser says (Mike DeBonis, 9 April 2017): President Trump’s top national security adviser said Sunday that Russia should be pressed on whether it knew the Syrian regime would carry out a deadly chemical attack against civilians in a rebel-held area last week. This entry was posted in Biological, Chemical, Press on 17 April 2017 by JP Zanders. ‘Toxic gas attack’ in Syria kills at least 58 people (Al Jazeera, 04 Apr 2017): Opposition says government or Russian jets pounded the town of Khan Sheikhoun in rebel-held Idlib. At least 58 people, including nine children, were killed in an air raid that released “toxic gas” on the rebel-held Syrian town of Khan Sheikhoun on Tuesday, a monitor said. Syria Conflict: ‘Chemical Attack’ Kills 58 People in Rebel-Held Town (Jack Moore, 04 Apr 2017): A suspected chlorine gas attack on a rebel-held town in Syria killed at least 58 people in the northwestern province of Idlib on Tuesday, according to a monitoring group. The attack took place in the rebel-held town of Khan Sheikhoun in Idlib province. Syria: suspected chemical attack kills dozens in Idlib province (Kareem Shaheen, 4 April 2017): Dozens of people have been killed in a suspected chemical attack in northern Syria, aid workers and local activists have said, in one of the largest mass casualty incidents using a toxic gas in the six-year conflict. This entry was posted in Chemical, Press on 9 April 2017 by JP Zanders. Hate mail for standing up for CW disarmament – A first? The news just broke that the Trump administration launched cruise missiles against al Shayrat airfield in Syria in response to the chemical weapons attack in Khan Sheikhoun, Idlib Province on 4 April. As usual with such religion-infused hate messages, the basic facts are all wrong and ignorance reigns supreme. This entry was posted in Chemical on 7 April 2017 by JP Zanders. This posting brings together the most important documents circulating at this stage. First, the minutes with the statements by UN Security Council (UNSC) members and debate on 28 February, during which a resolution to sanction certain Syrian individuals deemed responsible for the earlier CW attacks was vetoed, can be downloaded here. 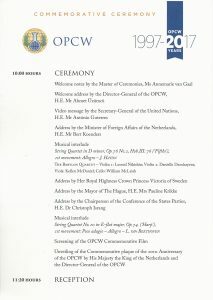 This entry was posted in Chemical, Document and tagged Allegation, Chemical warfare, France, Russia, Syria, UK, United Nations, USA on 6 April 2017 by JP Zanders. Russia Destroys Last Remaining Supplies of Deadly Chemical Weapon Soman (Sputnik News, 26 March 2017): Russia’s last supplies of the deadly chemical weapon soman have been destroyed, Russia’s Federal Administration for the Safe Storage and Destruction of Chemical Weapons announced on Saturday. 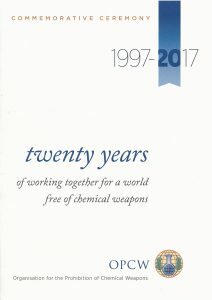 OPCW Director-General delivers keynote address at the international symposium on toxic substances in Singapore (HPN News Desk, 28 March 2017): The Organization for the Prohibition of Chemical Weapons (OPCW) Director-General Ahmet Üzümcü recently paid an official visit to Singapore, where he gave the keynote address at the Singapore International Symposium on Protection Against Toxic Substances. This entry was posted in Biological, Chemical, Press on 2 April 2017 by JP Zanders.